We had our first frost here this week, spelling death for the summer crops. We could talk about seasonal shift and plant cell structure, but instead we have another issue burning inside of us. This week we saw an ad for food purchasing that advertised the options available to customers: “Heritage breed, heirloom varieties, certified humane, certified rare breed, organic, natural, and local options available!” We jest in some of the details there, but the point we want to make stands: No wonder customers are confused! What do all those options mean? What is natural? What is local? What is heritage??? We also saw a buy-a-box-of-local-food-from-us company try to steer customers toward thinking that all of the food in their box was grown (sort of) organically (though we guarantee you it’s not), but also downplay the importance of organic practices. Yikes. This is a lot to sort out. We know that we are “insiders” in this world of small scale/local farming, and even insiders in the subset of that world: the organic/Certified Naturally Grown/synthetic free/non toxic sector of farming. We are the professionals, and even we are confused sometimes. We don’t often hop on this stage of “Let us help you understand it” but this week we find ourselves needing to. Why? Because we fully believe that food grown organically – in the manner that nature teaches us (free of toxic chemicals), is important – even critical-, and that food grown with attention to nutritional quality is vital for the health of our community. Furthermore, we know that those two things are not the same. Explanation forthcoming. Additionally, we know that the grand majority of farming today is not organic. Chemical pesticides and fertilizers are the norm. Hardly any education exists at all about how to manage pests or fertilize using naturally occurring substances. That makes it harder to be an organic farmer (or organic gardener, for that matter). Local farms are simply not an exception, as much as all of our community would like to believe that. Chemical farming is the norm to such a degree that in the world of agriculture, 99% of the voices say there is no reason to farm organically. However, a lot more than 1% of the consumers say they want organic food. Therein lies the problem. Farmers (and anyone who sells food) have a lot of incentive to tell their customers that what they are selling is organic. That gets tricky because to use the word “organic” you need to be certified by the USDA. So, unfortunately, words like “natural” or “sustainable” or “good for you and the planet” are used to describe food that is most certainly not free from chemical fertilizer and pesticides. We have so much that we want to shout from the rooftops about this subject, and this post is already too long (any readers still with us? anyone?). So we’ll plug on a little longer. Thanks for being interested in your health, our health (as farmers of the food), and the health of your (and our) descendants. Now relevant background info: Why do these things really matter? After all, 99% of agriculture says organic practices don’t matter, and that report from a reputable institution (Stanford) said that organic food is not more nutritious than “conventional” (a terrible term used for today’s chemical farming). Here’s where we break it down for you. It’s the reward for reading this far. – Soil biology IS soil health. Healthy soil allows us healthy plants. The healthier the plant, the more nutrition is contains. – There is hardly any soil around (especially on the East Coast), that currently has the composition to grow really nutritious food (without amending). – Chemical (also called synthetic) fertilizer wrecks (kills) soil biology. It also pollutes the watershed where it eventually ends up. Killing soil biology makes for less healthy plants, and thus less nutritious food. All of this is bad. – Chemical pesticides are the go-to way to handle bug problems on a farm. Round-up is the go-to way to handle weeds on a farm. These products are known to be harmful to people (and soil health, and animals, and the watershed…). The degree to which they are harmful is still debated, but that was the case with DDT, too. There is also (highly controversial) evidence that pesticides are harmful to the plants on which they are applied. Unhealthy plants = less healthy food. All of this is bad, too. – Organic farming can simply mean replacing toxic inputs with non-toxic inputs. This does NOT mean the soil is being made healthier, and thus does NOT mean the food being grown is more nutritious. (THIS is the problem with the Standford study. THIS is the nuance…the grey area…the details.) This does mean that soil biology has a better chance, and the farmers are not applying toxic products. That is good, but there is better. Because that is not the same as growing organic food that is also more nutritious. – Yes, there is good evidence that “not much” chemical residue remains on conventional food purchased by the consumer, and yes, there is evidence that the consumer can wash off their produce and likely not suffer much, or any, harm from the substances. And yes, conventional food may not be any less nutritious than certain organically grown foods. – However, if you are only concerned with chemical residue at the consumer level you are failing to consider the impacts of toxic chemicals for the farmers, their families, the soil biology, the wildlife, and the watershed. Those matter. – If you want truly nutritious food, you need food grown with attention to the actual thriving, diverse life and composition of the soil. Combine that with food grown organically, in the manner that nature demonstrates, with attention to plant health above all else, and everyone wins. How many local farmers grow food this way? Hardly any. (And those that do usually make a concerted effort to communicate this through all means possible: website, market booth, packaging, etc.) Despite the fact that we know we have a ton still to learn (who doesn’t? ), we know we are avoiding all the toxic inputs and going above and beyond organic inputs in order to grow plants that are as healthy as possible. This means more health (nutrition) for the consumers. This is what we explain on our tours (and in too-long blog posts). We know there are options for local food that are cheaper and more convenient than our food. And the providers of those options try to convince you, the consumer, that the food is produced organically (“pesticide free” “no spray” “sustainably” “good for you and the earth.”) How can you sort it out? It is hard, we know. But here’s our advice: 1) Re-read this post. 2) Start with the assumption that the food in question is grown with chemicals and no attention to nutritional content. 3) Talk to the farmer (not the re-seller – not the company that packed a box of food from different farmers). Talk to the actual farmer and ask for a public tour. Ask him or her to explain how they approach plant health, nutritional content, soil health, and pest and disease problems. It doesn’t have to matter if you don’t understand the answer. Listen for clues and listen to your gut. Search for the motivation of the farmer. See if it matches up with your motivation for eating and feeding your family. **Disclaimer: We know we are extremely privileged, well educated people of a majority race (relatively poor in money but rich in cultural capital). We know relatively few people have the privilege of putting so much attention to their health and how/where they source their food. Much work needs to be done with those that do not yet have this privilege. Today’s words focus on the starting point: Those that do have the privilege of choice, but do not have the privilege of knowledge. We dream of a future in which all people have the knowledge and means to seek out and acquire food grown organically and nutritiously. We dream of a time when we don’t have to make this speech – when chemically grown food is the 1%. Until then, thank you for reading, and thank you for wanting the food we grow. Fun and unrelated FYI: We are packing about 8 months of social engagement into this one upcoming weekend! Janet and Beckett (and Dan) are ready to venture out a bit (Beckett is now 3 weeks old!) and are headed (thanks to the generosity of others) to the Tricycle Gardens dinner, Dinner in the Field’s season finale dinners (at the Boathouse Restaurant, featuring some of our cooking greens), and hopefully a family trip to a showing of Charlotte’s Web by the Virginia Rep. We have our sights set high! We hope to see some of you around and about. Our Farm Share Bag (consisting of a farmers’ choice medley of produce, in one easy to order option), Asian Greens (Bok Choy), Beets, Broccoli, Chard, Chinese and Traditional Cabbage, Collards, Cucumbers, Eggplant, Escarole, Garlic, Ginger, Hearty Mix, Juicing Greens, Kohlrabi, Lettuce (three different types of heads), Peppers (jalapeno, sweet yellow), Radishes (black, watermelon), Salad Mix, and Turnips, …plus our Pepper Jelly, Salsa, and naturally leavened Hearth Baked Bread. Roots (carrots, turnips, or beets): Roast them! That is the simplest and most enjoyable way to use them this time of year, in our opinion. Roast them with garlic, salt, fat, and protein. OR – Roasted Vegetable Soup is tasty and seasonal. Cabbage: We love Fish Tacos with Slaw. We love Slaw with anything, really. Bok Choy: Our favorite way to prepare is braised in stock (any kind of stock or broth). (Braising is cooking in liquid for a few minutes.) The stems retain this satisfying crunch. Serve alongside or on top of anything! OR – Stir Fried Bok Choy with Ginger and Garlic. We attend one farmers’ markets this Saturday: South of the James in Forest Hill Park, from 8am – 12pm. 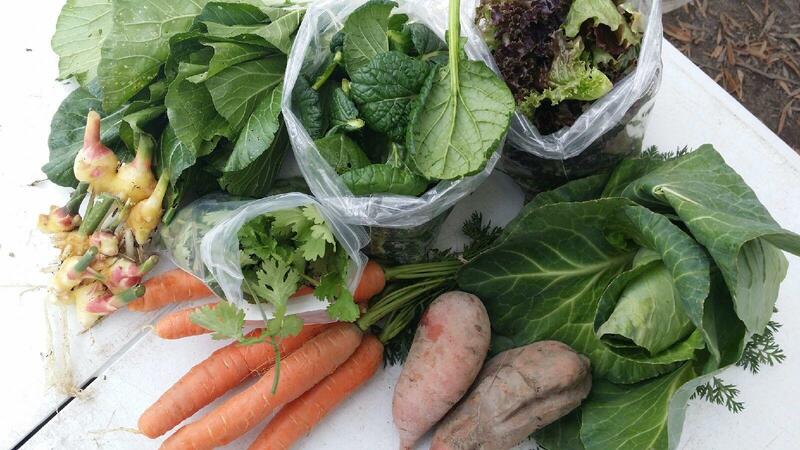 2014 Market Share CSA Members: Choose your selection through our Online Ordering to order for pick up on Saturday at our farm, at the Good Health Herbs in Market Square, or at the South of the James Market in Forest Hill Park.